The Fujifilm Pivi MP-300 is a palm-sized printer that cranks out playing-card-sized pictures in less than two minutes. Accepting its image data using PictBridge via a USB or infrared, it weighs just shy of a half-pound loaded with batteries and paper, making it kinda easy to carry around and ninja-print shots on the spot. It's $127, only in Japan so far. Wouldn't it be easier just to e-mail the pictures to whoever wants one? Some people are still stuck in the printing era. 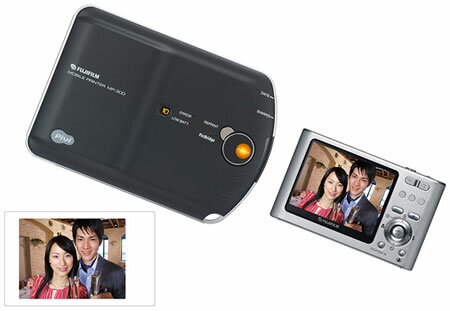 At least Fujifilm could have added Bluetooth to this new model.